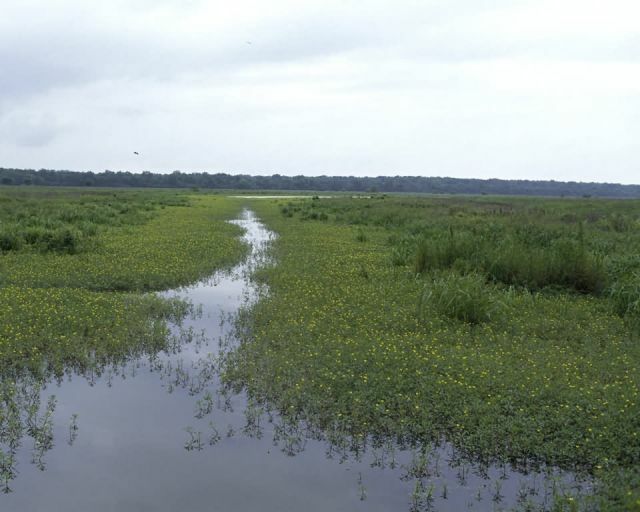 Tensas River NWR, Tallulah, Louisiana: The remnant bottomland-hardwood forest that makes up the terrestrial portion of Tensas River Refuge is home to the equally rare Louisiana black bear and Bachman’s warblers. The aquatic portion comprises oxbow lakes, streams, ponds, and the Tensas River. Here otters play, alligators bellow, geese congregate, and herons wade in the shallows. One of the last confirmed sightings of the presumed-extinct ivory-billed woodpecker was on what is now refuge land in the 1940s. Indigo buntings, painted buntings, summer tanagers, and prothonotary warblers are among the colorful songbirds found here. The giant trees draped with lovely Spanish moss are home to black fox squirrels, pileated woodpeckers, and barred owls. Coyotes, bobcats, and wild turkeys inhabit the forest understory. Visitor opportunities include canoeing (bring your own), fishing, hiking, wildlife observation and photography, hunting, and auto-touring. Be sure to bring insect repellent.